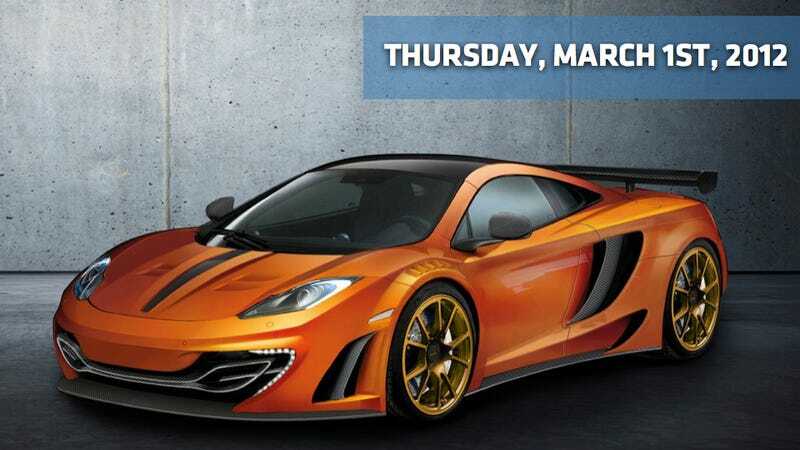 GTSpirit has the first details and pictures of the Mansory McLaren MP4-12C package it'll debut at next week's Geneva Motor Show. The German tuners have given the McLaren a new look with an ultralight hood and carbon fiber roof, front and rear apron — as well as a new front splitter and rear wing to help enhance aerodynamics, agility and handling. It's also received a power upgrade from the stock 608 hp to 670 hp at 7,100rpm thanks to a high-performance exhaust system, a new engine computer management tweak and a new air filter. It's also very orange. Chevrolet has tapped the director of "The Office" sitcom to direct a series of two minute commercials. Except, instead of a paper company in Scranton, PA, it's set in a Chevrolet dealership. The commercials, entitled "Under the Blue Arch," are kind of like mini-sitcoms with a touch of brand messaging weaved into them. They're very odd — and not really all that funny. One of the first episodes above has dealership employees break out into a 'Glee'-like musical number over the Chevy Silverado — until one of them takes it a bit too far. God, can't Bob Seger just let Chevy use 'Like a Rock' again? Because that was, far and away, the most badass ad campaign in the history of trucks. Instead, we're left with ironically poking fun at Ford's Amerigasmic Toby Keith commercials and "jazz hands." Sorry, but 'Glee' has already taken that particular punchline to the furthest-possible reaches of humor that it'll go. Oh, and they have a Facebook page too. 3rd Gear: House Republicans Think Obama Too Lenient With 54.5 MPG CAFE Standard?! I'm not entirely sure why, but House Republicans want the White House to answer more questions about its involvement in writing the 2017-2025 fuel efficiency standards, charging the Obama administration with circumventing the normal rulemaking process by negotiating directly with the automakers. It's a curious move for Republicans in Congress to go after the deal — which requires automakers to move to 54.5 MPG by 2025 — for being too lax in regulating the automakers. Unless they're going the other way — saying that it's not cozy enough. I don't see how that's possible. It's 54.5 MPG by 2025! Whatever — can't both parties just shut up and do their jobs? 4th Gear: The Best Pickup Truck In America Is... The Chevy Avalanche?! According to Consumer Reports, the "best" pickup truck you can buy is not the Ford F-150 or the Chevy Silverado. It's not the Pickup-Truck-Formerly-Known-As-Dodge or the Nissan Titan. No, it's the 2012 Chevrolet Avalanche. According to the report from PickupTrucks.com, it's the hauler that offers the best mix of on- and off-road capability, practical and stylish looks, and fun toys that put it ahead of its competitors. "The Avalanche provides the best combination of utility and versatility of any pickup CR has tested. Its unified bed and cab help give it a steady, comfortable ride, and the cabin is quiet," Consumer Reports says. Auto supplier Magna International has released details on its new concept study it'll debut at next week's Geneva Motor Show. It's called the MILA Coupic and it's the sixth member of the MILA concept family — a name that means Magna International Lightweight Auto. To put it simply, according to CarScoop, the MILA Coupic is a shape-shifting SUV that can transform into a pick-up or an open-air convertible. Yes, it's a transforming El Camino. In its "closed state", the Coupic is a five-seater SUV with an electrically operated top consisting of three layers and sporting large glass panels embedded in the textiles that make up the top with front and rear sections that can be opened separately, creating a convertible. I just think it's cool that there's an auto supplier that's still making concept cars. It's Spring and Bloomberg reports that there's more automaker love in the air. They're reporting that Fiat is still looking for a partner in Europe to address overcapacity and may consider an Asian tie-up, Chief Executive Officer Sergio Marchionne said. "There are not very many partners left in Europe," Marchionne, who is also Chrysler's CEO, said today in Brussels. "I'm looking at everybody." He declined to comment on any discussions with Peugeot and General Motors, which are said to be in talks on a partnership.